Microwaveable popcorn is a basic staple for enjoying a snack while watching TV or videos. There are lots of ways to make microwaveable popcorn and great tasty flavor varieties. In fact, it is a good idea to enjoy this treat whenever the urge to relax with a bag of spicy popcorn without a buttery flavor strikes your fancy. Give microwaveable popcorn a broader range of flavor with the recipes below. 1) Spray the prepared popcorn with olive oil in a large bowl. 2) Add in oregano or basil and garlic powder for Microwaveable Popcorn with an Italian flavors. 3) Toss with Parmesan cheese. 1) Spray prepared popcorn with olive, peanut, sesame or canola oil spray. 2) Add bacon bits and shredded cheddar cheese to prepared popcorn and a dash of sea salt. 3) Toss until ingredients are well blended. 1) Blend together about a half teaspoon of chili powder, a quarter teaspoon cumin and a teaspoon of sour salt. 2) Next, spray prepared popcorn with olive oil or butter spray and add chili spice blend. 3) Toss until popcorn is fully coated with the mixture. 1) Spray prepared popcorn with olive or peanut oil, adding a scant dash of cinnamon, cardamom, chili powder, turmeric and tossing lightly, this brings out a Middle Eastern flavor to Microwaveable popcorn. 2) For added flavor, toss with finely chopped raisins and almonds. 1) Take one packet of hot cocoa mix, a dash of cinnamon and, if desired, nutmeg. 2) Spray prepared popcorn lightly with butter to help the dry ingredients stick to popcorn. 1) Blend in about a teaspoon of anise or vanilla sugar as desired. To this add candied red hots or crushed peppermint candy canes and mini chocolate chips. This is always a favorite with the kids. 1) When you consider creating signature microwaveable popcorn snacks, choose blends like pistachios, pecans, mini pretzel, cheese and bacon bits. 2) Toss with a dash of cayenne pepper, a half teaspoon of chili powder and a quarter teaspoon of cumin. 3) Blend thoroughly until all ingredients are well mixed. 1) The next time you shop for dried fruits like apricots, pineapple, bananas, mangoes and papaya, use them in Hawaiian Style microwaveable popcorn. 3) Add whole macadamia nuts and lightly toasted coconut. 1) Add a bit of dried onion flakes and prepared microwaveable popcorn. 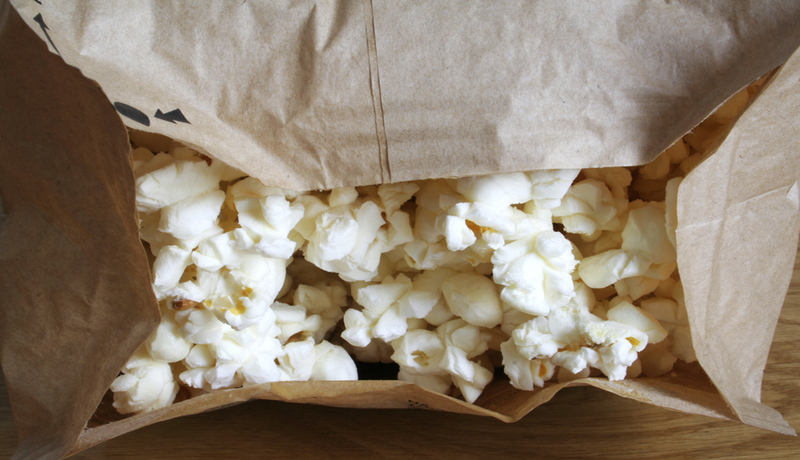 2) Spray prepared popcorn with butter spray and add in about a half cup of dried onion flakes. 3) Toss until well blended. 4) For added flavor, toss with a tablespoon of powdered buttermilk. 1) Use one packet of hot cocoa powder and a tablespoon of powdered espresso coffee. 2) Blend cocoa powder with espresso powder and add in one tablespoon of powdered sugar and one quarter teaspoon of chili powder.